Measuring just 1.17" (29.9mm) when fully retracted, this SEL-P1650 retractable zoom lens is super compact and easy to carry so you can quickly whip out your camera and spontaneously grab shots as they occur. It's perfect for traveling and other scenarios that require a lightweight, compact camera and lens combo. It covers a 16mm to 50mm range (35mm equivalent = 24-75mm) for flexible shooting, and is equipped with one ED (extra-low dispersion) and four aspherical elements, resulting in a high-performance lens that is surprisingly compact. Despite a 3x magnification ratio covering 16 mm to 50 mm (24-75mm 35mm eq. ), the SEL-P1650 is thin and lightweight thanks to a retracting mechanism that reduces the lens to just 1.17" (29.9 mm). It truly enhances the portability of E-mount cameras, giving users the means to capture spontaneous moments when on trips with a light and compact camera/lens combination. The SEL-P1650 is the first lens with an electrically driven zoom me chanism. As soon as the camera is powered on, the lens extends and is instantly ready for shooting. A dual-function control ring is used for both zooming and manual focus. 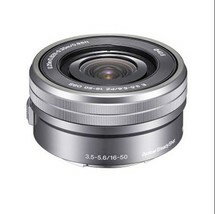 Sony 16-50mm F3.5-5.6 OSS Retractable (Pancake) E-Mount NEX Camera Lens Front and Rear Lens Caps, USA Sony 1 Year Warranty. Vivitar 3-Piece 40.5mm Filter Kit, UV, CPL, FDL. Pro Optic Lens Wrap, 15in x 15in (400mm x 400mm), Black. Universal Lens Cap Tether. Adorama 1836A Cleaning Kit for Optics and Cameras. Kit Includes: Spray Cleaning Fluid, Cotton Swabs, Lens Cloth, 3 Sheets Universal LCD Screen Protectors, Squeege Card, Lipstick Brush, Blower Brush, Lens Tissue, New Deluxe Storage Bag.